These two land patents are at the Library of Virginia. With the help of Bob Allen, I found them online at the library’s website. I then got the idea to draw them. The first problem with that is trying to read them. After hours of straining my eyes over them, I had enough of the information. I then emailed Bob and asked him if he knew how to draw land patents from the descriptions. He emailed back that he had drawn them years ago and he sent me his drawings. I then tried drawing them from scratch and checking what I drew against what Bob had drawn. I wanted to put the drawings on a map of the area. To do this, you must also locate the land patents of others, especially Maj. Thomas Walker because James I’s later patent connects to Maj. Thomas Walker’s patent and to “ye patent sd. Taylor now liveth on”. This map is the result of hours of work by both me and Bob. I then used the patent descriptions to label the points and the lines. I used some of Bob’s wording when I did this. You will find that information in the key which is below the map. 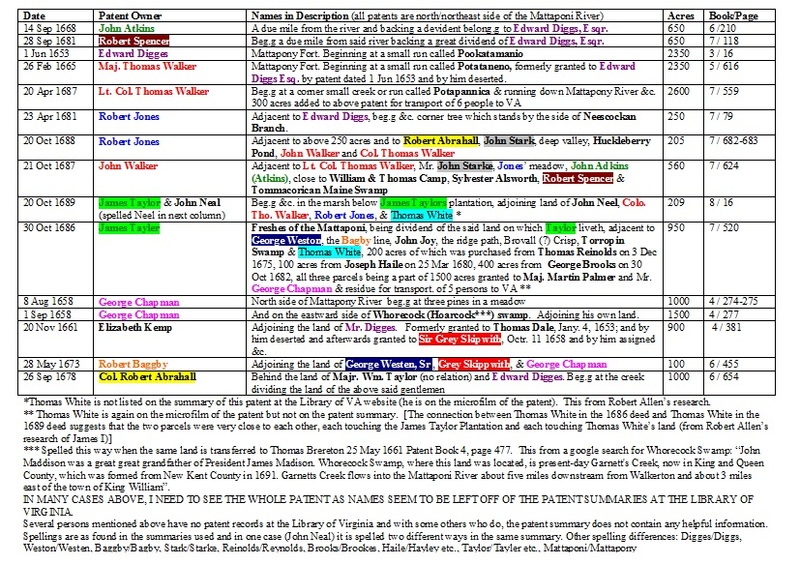 I also put together a chart to show the relationships of the different patents in the area that had a connection to the two patents of James Taylor I. In researching this area of VA I stumbled onto the website of Jerry and Cecky Walker. Jerry is a direct descendant of Maj. Thomas Walker and lives on part of his patent which has been in the family for over 300 years. He helped me by answering questions about the area and also referred me to his sister, Virginia, who is the genealogist of the family. Virginia and I corresponded by emails and found that we are cousins through the Todds (Ann Hubbard who married James Taylor IV was a Todd granddaughter). On my trip back to the states this summer, I met Virginia and she showed me around King & Queen County including some of the places on this map: the location of Ft. Mattaponi, Locust Grove, Hillsboro, and Henley’s Fork. Most of the lines of these two patents of James Taylor I are confirmed by neighboring patents. I have noted where I have not found them. There are also some small discrepancies in some measurements. Some distances and courses are not given and are guesses that are helped by landmarks on the topographic map or descriptions from neighboring patents. Robert Allen* has drawn these patents plus many more in the area that I have not included here. Some lines were named according to men who owned earlier patents that have often been divided and included in new patents. Land bordering on the southwest side of James’ upper patent and northwest side of his lower patent has several name associated with it and according to Bob Allen’s drawings was an area where several patents met or overlapped. The northwest side of the lower patent is called John Neal’s line, so he apparently owned this same land too, though I cannot find the patent. A short note about “freshes”: I believe that freshes means any tributary(s) to the river. The word is used in several of the patents that are near the patents of James I. Otherwise, all of these patents would be at the headwaters of the Mattaponi River. They clearly are not because they are in some way attached to the Mattaponi Fort/Edward Diggs/Thomas Walker patent. Part of this patent has been in the Walker family for over 300 years and is now owned by John H. (Jerry) Walker, a direct descendent of Maj. Thomas Walker (and it includes the site of Mattaponi Fort). H—I 350 poles, along the several courses of the ridge path (distance furnished by Joseph Haile patent 7 / 520), this line on the topographic map is 320 poles as other distances of the patent will not match if it is 350 poles, perhaps the Haile line extend 30 poles past the corner of James’ land. This is a chart showing land patents in the same area & how they relate to the two patents of James Taylor I or neighboring land patents.